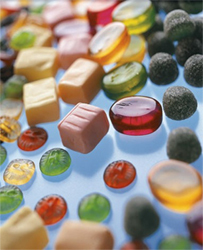 Among polyols, XYLISORB® xylitol is that, which exhibits the highest sweetness: it is the same as that of sucrose. It also provides a pronounced cooling effect in the mouth while remaining non cariogenic. Numerous studies reveal that xylitol combats tooth decay and positively discourages plaque formation. The combination of these three qualities make XYLISORB® xylitol an ingredient of exceptional quality for the manufacture of sugar-free chewing gums and other confectionery products, including tablets, jellies, or pharmaceutical formulations.